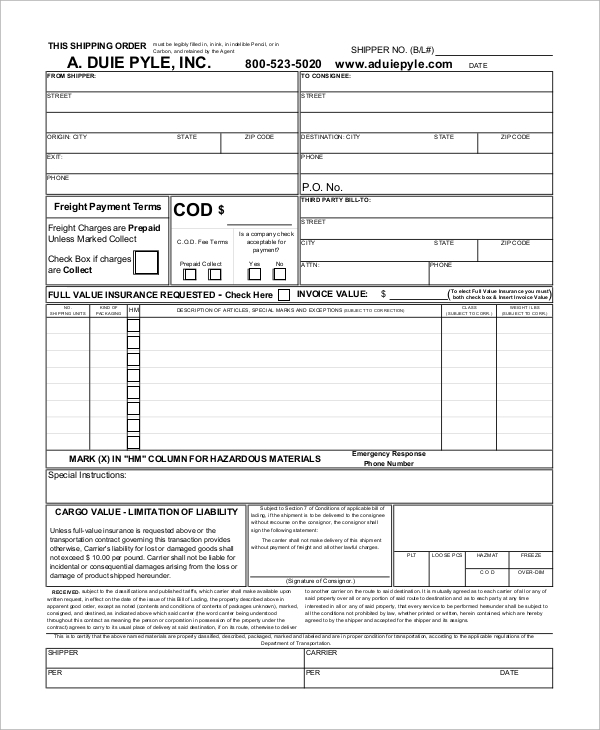 The bill of lading form is much essential for you when you run a cargo shipment service. If you have a carrier service, and you want to make sure that you issue proper bills to the customers for the cargo you are receiving, then you must go through these professionally accepted and circulated styles of the bill of lading forms. Here are some of the commonly used styles of the bill of lading and Sample Bill of Sales that you may use. 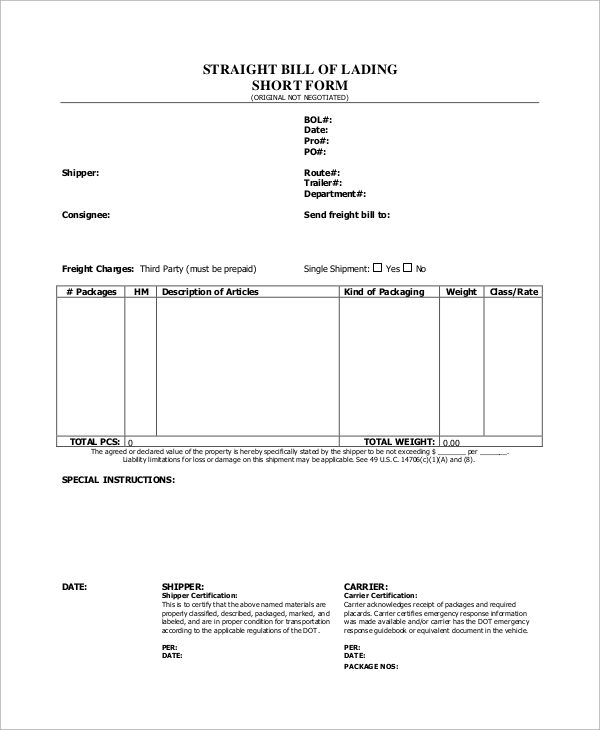 A straight bill of lading form contains the straight and simple fields, where you should write the names of all the items you are going to receive as the cargo. The simple format will act as both the list and the receipt. 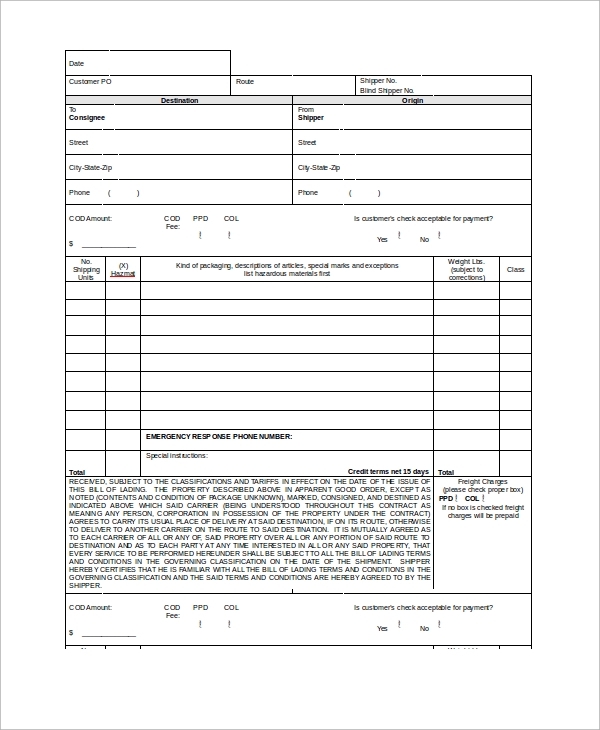 If you are looking for a basic format, where it will contain all important and basic information of the shipment, then you should look at this form. 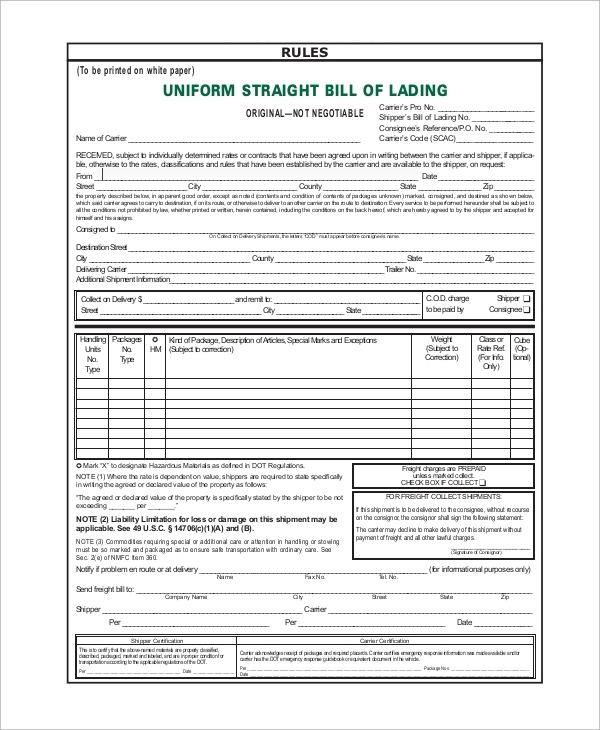 This one is a proper uniform bill of lading format. 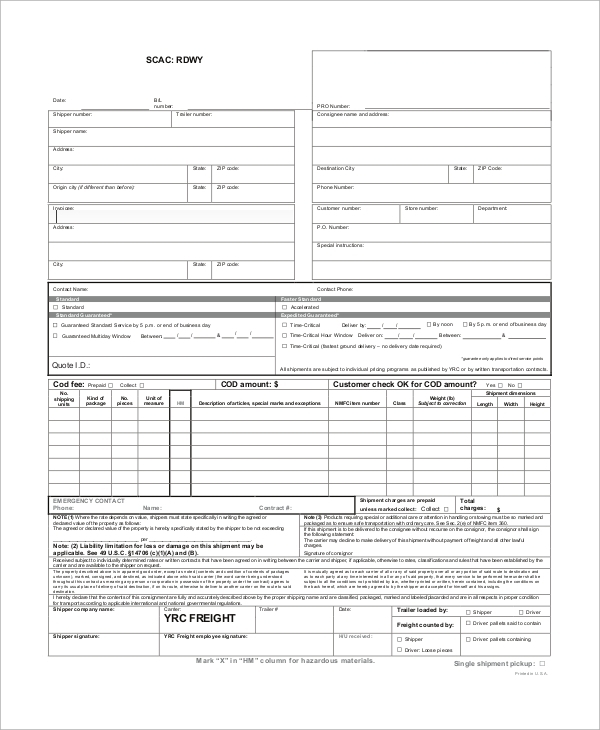 The blank bill of lading form is one of the best formats you would like to use to prepare your bill of lading freely and flexibly. It contains important information about the cargo shipment. The printable bill of lading form format is designed in such a way that you can take prints of the format instantly. 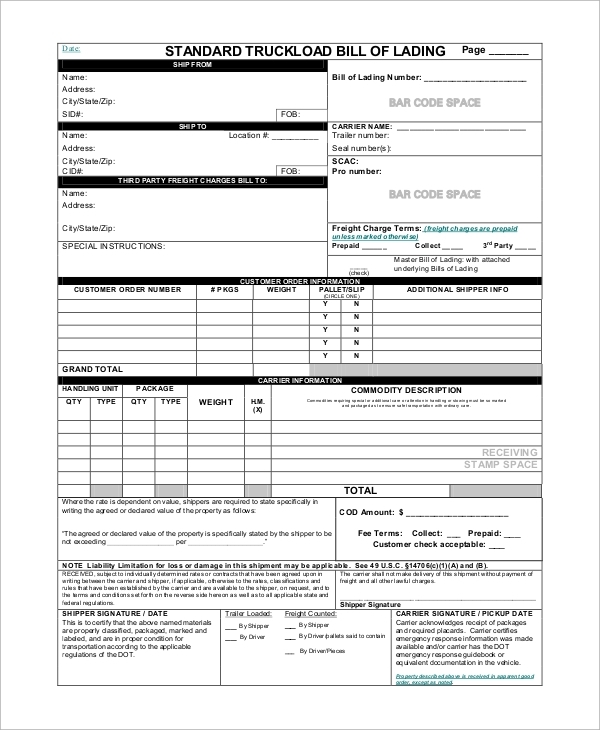 This is a ready form format, which contains all the fields that are necessary for the bill of lading. A standard bill of lading which you may use in any cargo shipment business is here. This is a standard, as the format is globally in use, and can be used anywhere. What Is A Bill Of Lading Form? 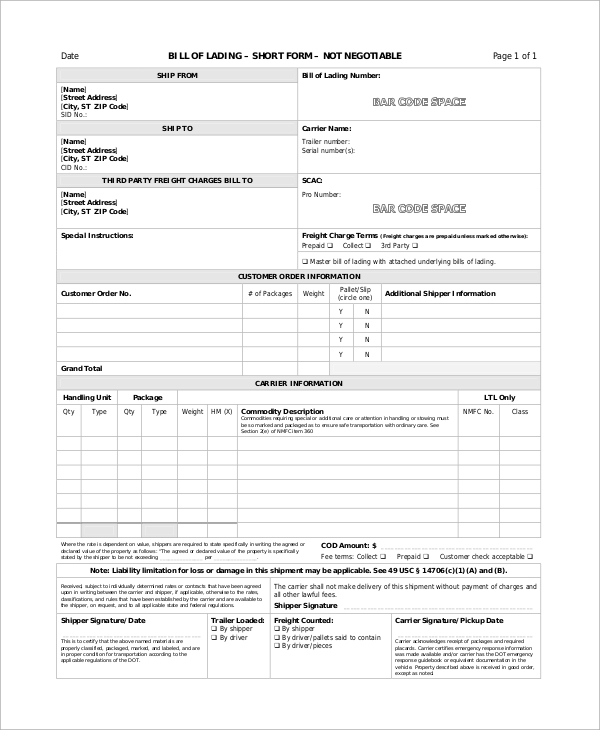 The Bill of Lading Sample form is used when you have to receive a shipment from your customer, and issue the list of export items on the bill while making it a formal receipt of shipment by you as the carrier. 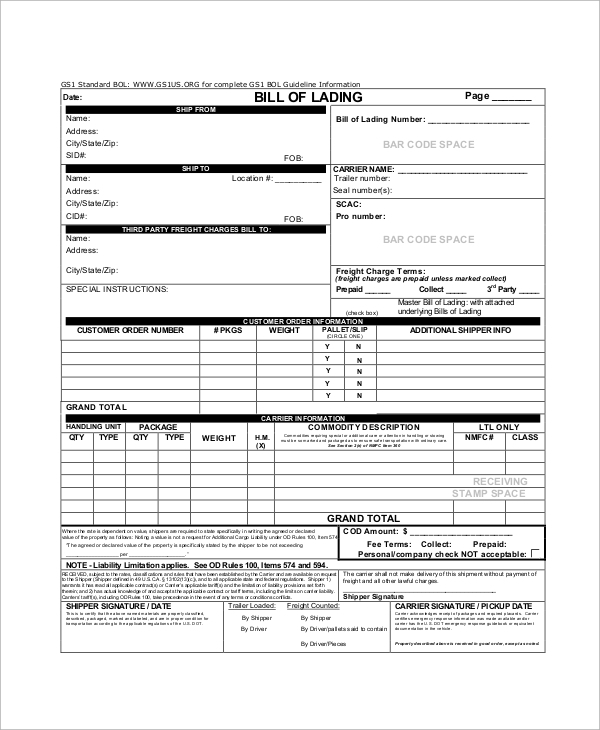 All carriers use this bill of lading form format to issue this receipt, and it’s a standard necessity and rule in shipping a cargo. No exporter or customer also go empty handed without taking this bill, and you ought to issue it if you are the carrier. This contains valuable information about the shipment, the carrier, the sender and the recipient. Crucial information about the shipment ad contains a complete list of items in the shipment with item name, type, weight, and dimension, etc. Relevant information about the carrier. Information about the customer, exporter or sender of shipment. Information of the recipient with address etc. Sending date of shipment and the delivery date anticipated. When you have to prepare the bill of lading format for your business, you may do so by simply referring to this format and form online. Here you will get the perfect globally accepted form and format, which can help you take your business ahead. Also get sample Equipment Bill of Sales for further help.